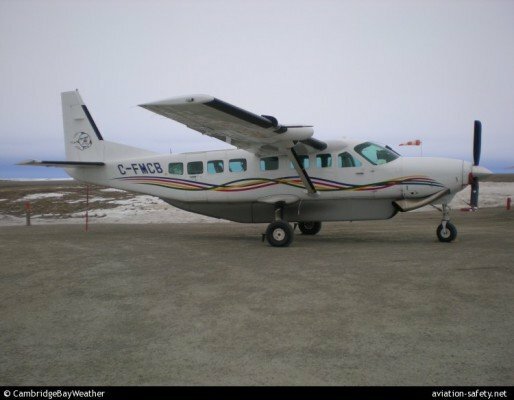 The Transportation Safety Board of Canada today released its investigation report into the 4 July 2011 runway overrun of a Missinippi Airways Cessna 208B in Pukatawagan, Manitoba, Canada. During takeoff, the aircraft did not become airborne in time, thus a decision was made to abort the takeoff. However, from that point, it could not be stopped before overrunning the runway. The aircraft left the end of the runway, travelled down a steep embankment and into a ravine where it caught fire, killing one and injuring eight others. A number of factors, including the takeoff technique, possible shifting winds and soft runway surface conditions contributed to reducing the aircraft’s takeoff performance. Also, the deceased passenger was not wearing a shoulder harness, which contributed to the seriousness of post-impact injuries, and subsequently his death in the post-impact fire. The operator has taken a number of steps to reduce these risks. These include a new short field takeoff procedure and improved training for pilots on takeoff and landing procedures, on the weather conditions and their effects on flight at Pukatawagan, and confirming that passengers are wearing their seatbelts and shoulder harnesses. The danger of runway overrun accidents was added to the TSB’s Watchlist in August 2010.